At 925 million, the number of hungry people in the world is unacceptably high. To combat world hunger, many scientists are working on developing crops that can resist disease and withstand the elements, from drought to floods. One such scientist is Sean Cutler at UC Riverside, whose breakthrough discovery last year of pyrabactin has brought drought-tolerant crops closer to becoming reality and spawned new research in several labs around the world. Pyrabactin is a synthetic chemical that mimics abscisic acid (ABA), a naturally produced stress hormone in plants that helps them cope with drought conditions by inhibiting growth. ABA has already been commercialized for agricultural use. But it has at least two disadvantages: it is light-sensitive and it is costly to make. Enter pyrabactin. This chemical is relatively inexpensive, easy to make, and not sensitive to light. But is it free from drawbacks? Unfortunately, no. 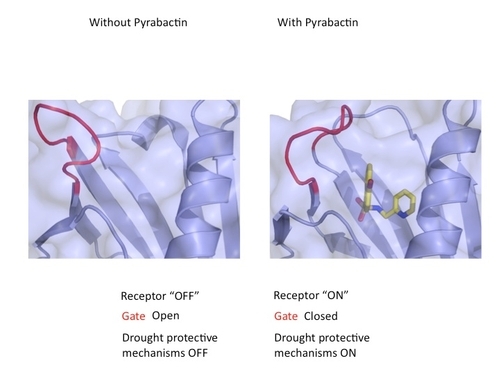 Unlike ABA, pyrabactin does not turn on all the “receptors” in the plant that need to be activated for drought-tolerance to fully take hold. What does that mean? A brief lesson on receptors may be in order. A receptor is a protein molecule in a cell to which mobile signaling molecules – such as ABA or pyrabactin, each of which turns on stress-signaling pathways in plants – may attach. Usually at the top of a signaling pathway, the receptor functions like a boss relaying orders to the team below that then proceeds to execute particular decisions in the cell. It turns out that each receptor is equipped with a pocket, akin to a padlock, in which a chemical, like pyrabactin, can dock into, operating like a key. Even though the receptor pockets appear to be fairly similar in structure, subtle differences distinguish a pocket from its peers. The result is that while ABA, a product of evolution, can fit neatly in any of these pockets, pyrabactin is less successful. Still, pyrabactin, by being partially effective (it works better on seeds than on plant parts), serves as a leading molecule for devising new chemicals for controlling stress tolerance in plants. Each receptor is equipped also with a lid that operates like a gate. For the receptor to be activated, the lid must remain closed. Pyrabactin is effective at closing the gate on some receptors, turning them on, but cannot close the gate on others. Cutler and colleagues have now cracked the molecular basis of this behavior. In a receptor where the gate closes, they have found that pyrabactin fits in snugly to allow the gate to close. In a receptor not activated by pyrabactin, however, the chemical binds in a way that prevents the gate from closing and activating the receptor. So he and his colleagues continue their research on pyrabactin derivatives, having set their eyes on the prize: An ABA-mimicking, inexpensive and light-insensitive chemical that can be sprayed easily on corn, soy bean and other crops to help them survive drought – one effective approach to combating and preventing hunger worldwide. Imagine that!